The nation's top economic planning body yesterday denied a report that it had approved the construction of a high-speed railway linking Shanghai with the scenic city of Hangzhou in eastern China's Zhejiang Province. "Our commission has never given a go-ahead to the construction of the planned project," a press official from the National Development and Reform Commission (NDRC) said. The female official, who declined to be named, did not elaborate. Both domestic and international enterprises have given attention to the rail project for the vast investment it will bring to the region, estimated at involving 30 billion yuan (US$ 3.6 billion). The official's remarks targeted a news report yesterday in a local newspaper, the Hangzhou Daily. It quoted a local government official as saying the NDRC has allowed the 170-kilometre-long project to be built beginning this year with a completion date set for 2009. The project will adopt the magnetic levitation, or "maglev," technology and is expected to be jointly funded by the central and local governments, the report said. But it gave no details on whether construction and supply contracts have been awarded for the project. However, officials from both the Shanghai and Hangzhou governments reached by China Daily refused to confirm the project. Such a high-speed link would reduce the time for a trip from Pudong International Airport in Shanghai to Hangzhou to 27.5 minutes from about three hours now, according to the report. Shanghai boasts the world's only commercial high-speed railway supported by maglev technology. 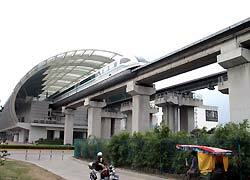 The maglev railway, linking Shanghai Pudong International Airport and the city's eastern suburbs, was developed by Germany's Transrapid International Consortium. That rail line involving an economic input of US$1.2 billion uses a powerful magnetic field to suspend trains above the tracks. Its top speed is 430 kilometres per hour. As a major move to alleviate the nation's rail bottleneck upon its rapidly developing economy, the central government has planned to invest more than 100 billion yuan (US$12 billion) in 58 new projects and 48 extended projects this year. A subway project linking Dongzhimen of Beijing and Beijing International Airport is to kick off this year, Liu Zhiyuan, general manager of the China Railway Electrification Engineering Group Co Ltd, was quoted by the Beijing News as saying. The 27-kilometre expressway project will be jointly built by five domestic enterprises involving a 5 billion yuan (US$600 million) investment, Liu said. He added the subway will be completed within three years to serve the Beijing Olympic Games in 2008. The designed train speed is 100 kilometres per hour and people will be able to arrive at the airport within 15 minutes, thanks to the project, according to Liu.